A memorable radio personality breaks through the clutter of the airwaves to become an icon on air and off. Focus your efforts beyond the microphone to stand out in a competitive industry. Announcers whose voices may be familiar often become anonymous when they step out of the radio booth. Set a goal of becoming visually recognizable in your city. Look for opportunities either as part of a station project or on your own to be photographed at events, charity drives or festivals for various newspapers or websites. Get comfortable talking with people in ways that don't involve the radio microphone. Look for a style that will set you apart from other announcers in your community -- maybe you can always appear in cowboy boots or with rings on every finger. You have more leeway than a typical TV personality, so use that advantage to be unique. A TV station can give you the visual outlet you need to be seen and not just heard. If your radio station already works with a TV station, half your work is already done. If not, get to know the reporters and anchors at one of the top news stations. By developing these contacts, you can get involved with the TV station's community projects, maybe even co-hosting a telethon or appearing on a morning news show. A news/talk radio host might be used as an election night commentator or sports analyst. Most cities have one radio announcer who is the go-to authority on music. Strive to be this person. If you appeal to a younger audience, become the person who knows the club and concert scene. If you're a seasoned veteran, position yourself as the one interview who can talk about Elvis Presley or The Beatles. 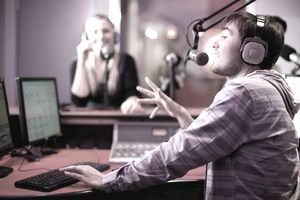 Maybe you can showcase your expertise on your radio station website as a way to advertise your knowledge. You will be amazed at how often TV reporters come calling once they know your expertise. This strategy also works for non-music announcers who can talk intelligently about politics, business or sports. Getting your name connected to an event is an ideal way to get people talking about you. If you have a passion for music, you could host a live remote to collect listeners' unused band instruments to distribute to schools in need. Like to play golf? Host a tournament for charity. Make sure to contact news organizations in your city to get coverage. You will need to sell your event as something that helps the community and not just make it a self-serving publicity stunt. Radio is a volatile industry. You may be your town's #1 country music jock and wake up to find your station has switched formats to hip-hop. But most established personalities weather these storms. Develop yourself as a personality that's larger than the format you present, so that you can switch from Top-40 to Oldies as you get older. Your value will come in your longevity in your city, because the majority of radio announcers are in a constant state of starting over with new jobs in new cities. Becoming a beloved radio personality takes work beyond your air shift. By putting in the extra hours, you'll get the affection of your community and hopefully a larger paycheck by being an indispensable asset for your station.